We are fortunate to have the voluntary services of Gavin Fischer and local Kaya who run a soccer program on a daily basis for approximately 100 boys from Alexandra town -ship. The boys ranging in age from 6 to 18 are taught basic soccer skills on a sports field near Nobuhle Hostel after school each day. Not only do they receive coaching but the activity keeps these under privileged children off the streets in the afternoons. In winter months we enter an under 13 and under 16 team in the local league. 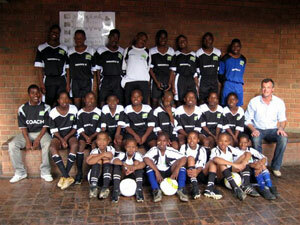 The total operating costs of the soccer program are R5000 ($375) per month.